Both coasts offered fun waves all weekend, coming in at a small and early offshore 2ft on the Surf Coast with 3-4ft sets east of Melbourne Saturday, with a touch more size and power Sunday to 3-5ft east of Melbourne. Yesterday's small spike in swell has since dropped and the surf is bottoming out across the state with tiny waves on the Surf Coast and easing 3ft waves on the Mornington Peninsula. The next couple of days will be worth giving a miss, with the swell expected to remain tiny into tomorrow under strong but easing N'ly tending N/NW winds. 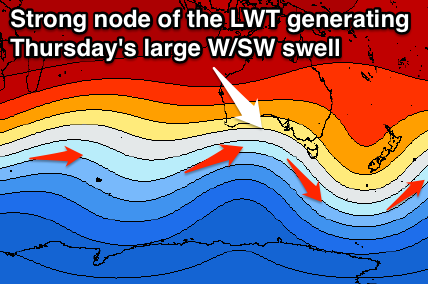 A late increase in acute W'ly swell is due, peaking Wednesday but the westerly nutare is worrying me a little. The swell will be generated by a short-lived fetch of W'ly gales from a south-east dipping cold front firing up to our south-west overnight and isn't really due to impact the Surf Coast. We may see 1-2ft sets Wednesday morning, while the Mornington Peninsula should offer more size to 3-5ft. Winds will unfortunately be unfavourable for the Mornington Peninsula with a fresh W/NW tending NW breeze. Thursday and Friday are the days to surf, as the much anticipated large pulse of W/SW groundswell fills in. A strong node of the Long Wave Trough is moving in from Western Australia, bringing with it a couple of vigorous frontal systems. An initial system will be too far north and not deliver any swell to us, but the secondary polar front firing up south-west of WA and then racing towards us while generating a fetch of severe-gale to sub-storm-force W/SW winds should produce a large W/SW groundswell for Thursday and Friday. The swell will push east a little quicker than ideal, escaping the swell it's generating, but the wind speeds should override this and produce a building swell to 5-6ft+ across the Surf Coast during the day, with the Mornington Peninsula building to 10ft. Winds will be best for the Surf Coast with a fresh to strong offshore W/NW'ly Thursday morning ahead of a shift to the W/SW around midday with the passing of the front. Friday is looking a lot better than it was last week now as winds tend back to the NW on the Surf Coast before swinging more W'ly through the day. The swell will ease steadily though from 5-6ft on the Surf Coast, down to 3-5ft into the afternoon and down from 6-8ft+ on the Mornington Peninsula. The easing trend will be softened into the weekend by a much weaker trailing front pushing in on the tail of the system responsible for Thursday's swell. This should keep 3ft sets hitting the Surf Coast with 5-6ft waves on the Mornington Peninsula under NW tending W/NW winds Saturday and then onshore SW winds Sunday. Longer term a very long-period but inconsistent and small-moderate W/SW groundswell is due next Monday, generated in the Southern Indian Ocean, but more on this Wednesday. Update: Tomorrow's W'ly swell is looking better now, with the unfavourably tracking front firing up quickly in our swell window (below) now forecast to be much stronger. The Surf Coast will probably see 2ft waves across most breaks, with 3ft sets at swell magnets such as 13th Beach, while the Mornington Peninsula should come in at 4-6ft. 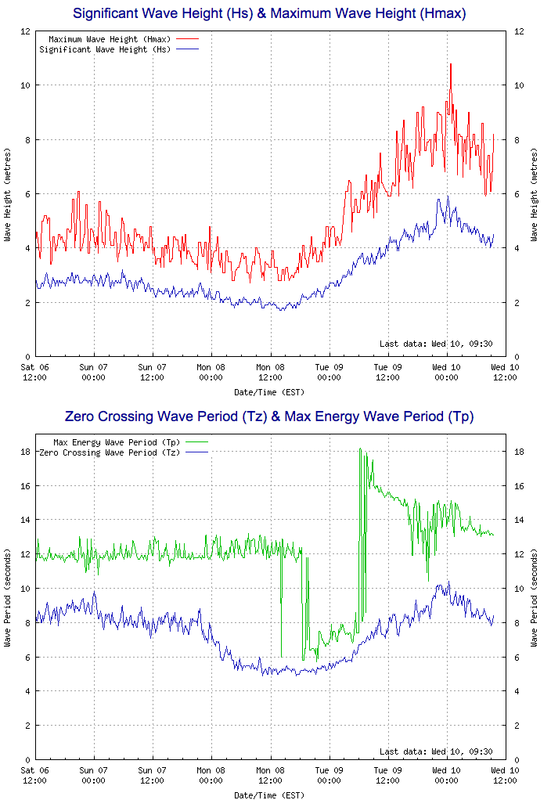 Classic example here of how the Sorell buoy can sometimes be quite misleading. There's an oft-used rule of thumb for Torquay surfers that significant wave heights in metres at the Sorell buoy (if the period is strong enough) equates to surf size in (surfers) feet across the Torquay stretch. So ordinarily, if you'd have looked at the Sorell data this morning and hadn't see a synoptic chart for a while, you'd have assumed that the 5-6m Hsig values overnight (with a strong swell period) would mean 5-6ft surf this morning. Especially in light of the buoy picking up an 18 second leading edge yesterday morning. In actual fact, surf size came in at 2ft in Barwon Heads and 2-3ft in Torquay.